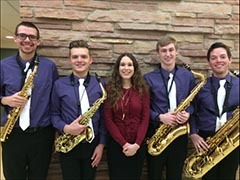 The Kansas State University Saxophone Quartet received second place/alternate at the Music Teachers National Association West Central Division Collegiate Chamber Music Competition Jan. 8 at the University of Colorado, Boulder. This ensemble, directed by Anna Marie Wytko, associate professor of saxophone, competed against some of the finest chamber music ensembles in the country including groups from Colorado, Iowa, Kansas, Minnesota, Missouri, North Dakota, Nebraska and South Dakota. The ensemble consists of graduate saxophone students John Ashburn and Michael Meier and undergraduate saxophone students Adam Lechner and Jacob Wright.